After a walking trip through some fairly heavy blowing snow, we decided that we’d try to gamble and see if we could get into Hawksmoor in Seven Dials for a lunch (they were out of reservations, but sometimes I’ve gotten lucky at busy places). However, this time luck was not on my side, so we needed to find someplace else good in Seven Dials to eat. Luckily, my sister-in-law pointed us to World Food Cafe. World Food Cafe is a cozy vegetarian place, one which I was already somewhat familiar with, since I’ve had a cookbook from them for a few years. 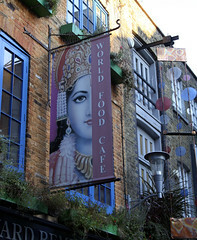 Nestled into a small kitchen on the first floor above Neals Yard, they are a vegetarian restaurant, focusing on providing a good cross-section of vegetarian dishes from around the world. Indeed, the menu there is rather daunting, with a large chalkboard outlining dishes ranging from Indian dals, to Egyptian falafel, to West African dishes, to Mexican and Latin American dishes. Once you order, they assemble your food in their open kitchen and serve it up to you. 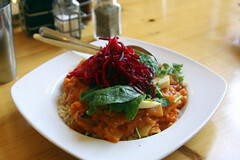 Both Carol and I opted for the West African meal: sweet potatoes in a spicy ginger peanut sauce with beets and bananas. Interesting combination, the sweet potatoes were very flavorful, the peanut sauce pleasantly nutty and spicy, and the beets and greens adding a nice overall crunch and a little bit of flavor to the dish. Honestly, I would have left out the bananas, they made the overall dish a little sweet for my general tastes, but it wasn’t bad, either. Overall, this dish was quite a success. 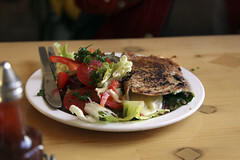 My sister-in-law ordered the Oat Pancake, which was also good: the nicely done cake was folded over cheese, spinach, and salsa, and paired with a nice salad. Overall, World Food Cafe was a very pleasant find: cheap and reasonably healthy vegetarian food in a neighborhood not generally known for either affordability or vegetarian food. It’s definitely a vegetarian place that is truly good, not just “good as vegetarian places go.” I’d certainly wouldn’t mind going back, and those people that enjoy vegetarian food should certainly seek this place out.